It took almost three years of searching and lots of hard work renovating. But we are so happy to now share Eighteen97, 5 star luxury boutique bed and breakfast in Goathland, North Yorkshire with you. Do come and try it for yourself, we are certain you will enjoy it. Interested to know more about Eighteen97 B&B? Built as a holiday home from the remains of the old Goathland church for a German classical pianist, Christian Gottlieb Padel. It is his initials which are inscribed above the door. Most notably, with the date of construction, 1897. A nod to the initial Arts and Crafts style remains with a stunning centrepiece fireplace and parquet floor in the sitting room. 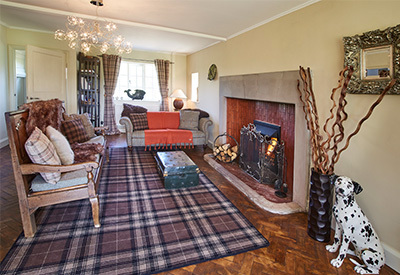 Relax by a roaring fire, chat with friends or simply soak up the North Yorkshire moorland views on offer. The gardens at Eighteen97 are a delight. Although very much work in progress after some years of decline. Take a wonder, you will find a quiet spot with a good book. Pick an apple from a tree or take up the challenge with a traditional garden game, we have boules, croquet and quoits. Or simply sit and soak up the beautiful North York Moors scenery from our bed and breakfast gardens. Your boutique bedroom at Eighteen97 bed and breakfast offers you timeless elegance with facilities to rival the best of boutique hotels. Packed with little touches to make your stay extra special. With super comfy beds, you may not want to leave it! Contemporary ensuites compliment. You will find luxury Temple Spa toiletries along with super soft bath sheets by Royal Appointment! We have a passion for food at Eighteen97. Our breakfasts are awarding winning for a reason. The traditional Yorkshire breakfast is always on offer. Or try one of our changing seasonal breakfasts. All use super local produce from here in North Yorkshire and all are lovingly homemade. If you are hiking or simply sightseeing enjoy our packed lunch or treat yourselves to our traditional picnic hamper. And finally indulgence, enjoy our Movie Box packed with treats or maybe dip into the honesty tuck box packed with goodies galore! Or if you are thinking of special time away, with those special people around you, talk to us about our celebration packages, perfectly tailored to your requirements. Eighteen97 bed and breakfast is quietly situated, within the unique moorland village of Goathland. 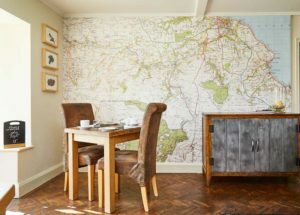 We are perfectly located to enjoy the stunning moors and coast of North Yorkshire. See the sights by car, bicycle, on foot or board a steam train at Goathland station, you can do it all from the doorstep of Eighteen97. Whatever your reason for staying you will always be assured of the same warm welcome and delightful surroundings. Most of all Eighteen97 bed and breakfast, North Yorkshire, has to be your first choice 5 star luxury boutique B&B.